The grassroots movement to free Paris Hilton seems to have taken to new heights in Las Vegas, adorning the billboard at the Palms Las Vegas. Or has it? At a glance, the sign seems to pay homage to the heiress who was sentenced to 45 days in jail. But as Norm Clarke of Norm! Vegas Confidential points out in his Las Vegas Review-Journal column, Palms owner George Maloof is having fun with a publicity stunt. The easily missed fine print on the sign says "trip," referring to a buffet promotion that includes a drawing to win a free trip to Paris, France. According to Norm, there has been a lot of buzz about the offer, including one man who asked if the free trip was to see Paris Hilton in jail. Ha! Now that is a trip that some might consider priceless. 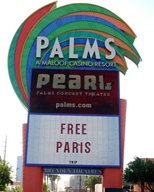 In addition to its marquee, the Palms is running a full-page advertisement in Sunday's Las Vegas Review-Journal that screams FREE PARIS and whispers "trip" along with the phone number and nothing else. It will be interesting to see what kind of response the property receives in the days ahead. Maloof, who has always been supportive of the community, is also donating a week's buffet revenue to Mother's Against Drunk Driving (MADD), about $60-$70,000. Anyone who reads my blog knows that I'm not a fan of piranha publicity, but this stunt has real merit. The buzz over Paris Hilton's plea for a get out of jail free card has captured the fancy of almost everyone. So, this publicity stunt is timely, topical, raises money for charity, and, best of all, no one gets hurt. Besides all that, it's very, very Vegas. "Once again, it should be 'Fair Punishment for Paris,' not 'Free Paris' or else, the media will portray us as brain-dead fans who idolize Paris Hilton for only being so glamorous. A very insulting and false fact for many fans." — Paris Hilton Site, talking about the Palms sign, but selling, um, "Free Paris" T-shirts. That's great. I love it!! !